Technology addiction is the addiction which I picked up after coming to IIT. Entering into IIT I was ignorant about technology. People around me could program an AtMega16 and talk about Python. I had no clue what a micro-controller is and all I knew is that Python is a reptile. I had to find my own place and CFI came in as a blessing. Unlike electronics where a lot can be done in one room and few tools, for mechanical activities you need certain expensive tools and a workspace. CFI was launched in our first year and the ‘Archimedean Amphibian’ team which I was a part of were one of the first to use any tools from CFI. With CFI for the first time it was possible to real mechanical work by students. A million thanks to the CFI founder team will not be enough. The talent was not more isolated in hostel rooms. CFI was a single place for all the metal and silicon heads to hang out. The technology revolution had begun in insti, under a single roof you had people building amphibian vehicle, ornithopter, miniature airplanes and robots. For me the centre of attraction was a bunch of people running around with tubes in their hands and running around to do profile cutting. Someone told me they were building a FSAE car. After building the Archimedean amphibian I would not return to CFI for next three years. I would use the skills gathered from my first year to build few more products and gather more skills. 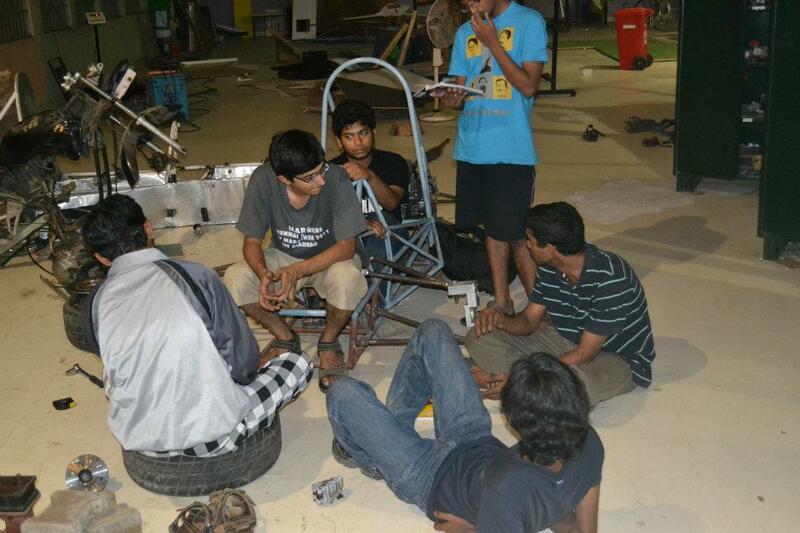 By this time the old FSAE team had dissolved and there were words that a new team would be made. I would join the team as a Chassis team member and eventually end up leading the Chassis team. FSAE is an unforgettable experience; anyone who is serious about technology should experience it once. FSAE tests you on every front, may it be technology, innovation, manufacturing, project management, funding you name it. This testing makes sure you are left with only the creamiest of the cream of the country. People in here are not working for a certificate or a resume point because the effort is not worth it; they are working because they are addicted to technology and automobiles. When you are trying for the third time to build the first FSAE car things were not going to be easy. From higher authorities to team members it took a lot of convincing to get the project up. 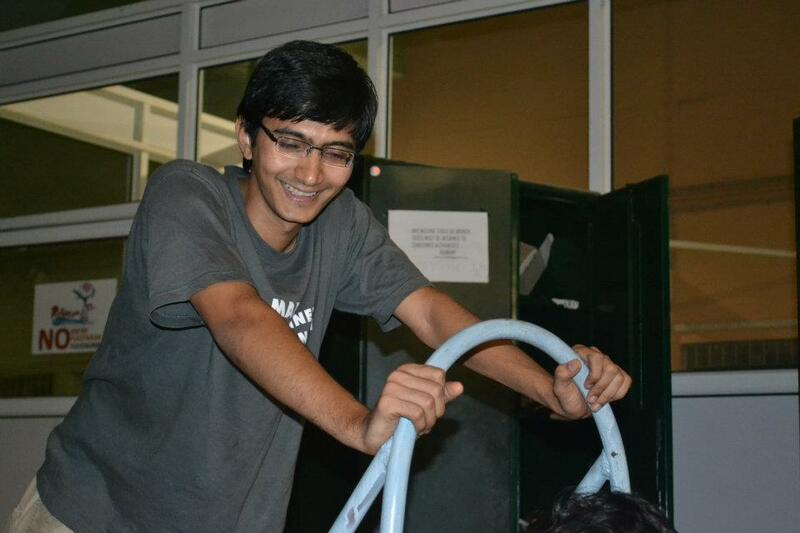 Once the project was approved the FSAE core team consisting had a huge responsibility to shoulder. We were technically strong and determined to get things done. As is the case with many tough projects after few months the team undersized from full time 50 to full time 10 and occasional 5. The design phase was a nightmare; we had no experience, limited data and no structure. Everyone including the core members was learning. Every week we would have a meeting where Arun would grab a whiteboard and a marker (after searching for 30 min) and start with “Ok set, lets list down tasks and deadlines”. We would come up with a timeline almost in every meeting and the details kept lowering. We began with a gantt chart for every phase and in few months the timeline said ‘Make the car by May 2012’. We would say we are building a formula car and every second is important and then you find one guy walking in the meeting late by half an hour. This got many to lose interest and they left the team. Thanks to the ‘Few Good Men’ (safe to say as we never had a female near the car except occasional girlfriend visits) the project was surviving. Juniors and seniors alike had taken up equal responsibility and everyone was working shoulder to shoulder to finish the design. We had done a good job on component design but due to lack of experience a lot had gone wrong in system design and this was going to haunt us in manufacturing. There was never a design freeze and the transition from manufacturing to design happened over couple of months. As happens in every project uncle Murphy came knocking on our door. A chassis which was supposed to be flat would not be flat. When we put in the suspensions for the first time the frame bottomed with it everyone’s heart sank. We figured out that someone had forgotten to take in a Cos factor while designing the suspension but with an enthusiast team we were able to make new bell-cranks in a day. System integration, interferences, tolerances and rules would ask for redesign in every part and the target would look more and more difficult. We braced ourselves as the Chennai summer was coming. To add to the trouble CFI decide to renovate, so we would sit in a workspace full of dust with sun shining at 42degree a jackhammer loosening all the nuts and bolts in our head and trying to build a car. When the car looks 60% complete and only a two months to competition the horror strikes, I had done a stupid mistake and the chassis was not fit to clear the rules. With all the parts mounted on the frame it looked almost impossible to change the chassis, I thought the team is going to kill me. Instead they decided to do the impossible, we made a new chassis in 2 days and the new vehicle was up on the wheels in a week. An example of team work I had never seen in insti. With all the deadlines approaching team would push itself to its best to finish the reports and vehicle in time. I had spent 5 years in insti, finished my ddp and had enough of Chennai heat but how could I overcome the addiction. With the team struggling, every hand on the deck was important and I had to fight out with my parents for extending my stay in insti for 2 more months. We did it after 5 years of struggle since the inception and 15 months since the new team was formed, Team Raftar had finally delivered their first vehicle. It was nowhere close to international standards not even national standards. We went to FS UK but RFR 12 could not even clear scrutiny (again because of my mistake, not sure why they have not killed me yet). We had lost the battle but won the war. The biggest hurdle of making the first car was cleared and we had ignited enough interest inside insti to keep the project running for upcoming years. RFR 13 was an example of how fast we can move to a good vehicle, a 100kg lighter vehicle with improved performance and reaching the dynamic events in FSG. The current team has the brightest people I have worked with and RFR 14 looks to be taking quite good shape. The team has made huge improvements in system design and project management and that is reflected in the confidence of the team. We have a long way to go to reach international standards but it is no more a distant dream. I am continuing with my addiction after graduation working on a startup to design electric scooters for India. I still keep interacting and keep taking help from old and new members of Raftar to help me achieve my dream, because without these people my life would have been very different. I wish Team Raftar and every other team working in CFI the very best of luck for on-going and future projects. If needed I would be very much willing to extend my support in any way possible to any of these projects. 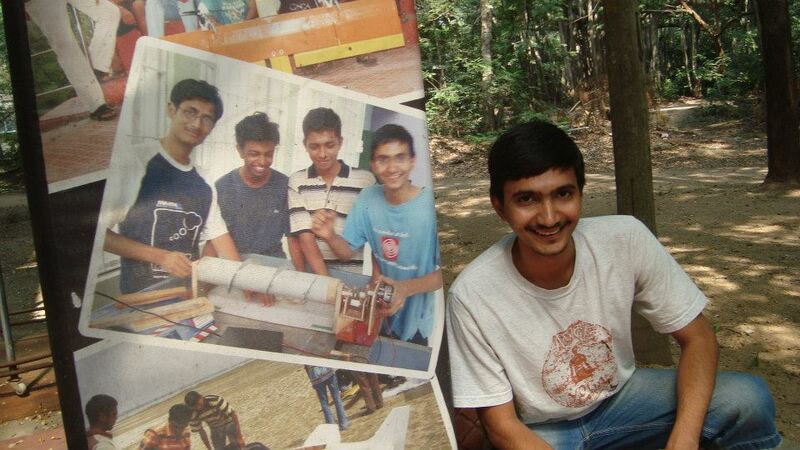 -Swapnil Jain was an active member of CFI and participated in various technical competitions. He graduated from IIT Madras with a dual degree in Engineering Design in 2013 and is also a Co-founder of Ather Energy.